Les Arnold's dream of flying began when he was a young boy helping his Dad on a chicken ranch in Hayward, California. In the midst of his chores he could often be found gazing skyward in fascination at vultures circling without effort or at seagulls swooping and gliding over newly plowed fields as they searched for tidbits of food. The marvel of flight took root in his mind and was with him his entire life. In 1928 when he was 14 years old, Les found a set of plans for a hang glider in a book of Things a Boy Could Build. Being of a practical nature, he had to know if this glider would really fly, so he built one out of available materials. He did get off the ground in it and made quite a number of short gliding flights before one of his friends had a minor mishap with the machine. After that the glider was grounded by parental fiat. By 1937 Les's interest in gliding had revived and he finally made contact with a group of other interested individuals in the Bay Area of California. Gliding was just getting off the ground when, following the air attack on Pearl Harbor, all coastal air activity in California was stopped. So it was back to dreaming again until 1947 when Les bought a war-surplus TG-3 from Eugart Yerian. Redwing was the joy of Les's life and he finally felt he was really living. He entered contests with the sailplane and usually brought home some sort of trophy. A trip to the 1949 Nationals at Elmira and a talk with the Schweizers further fired his imagination. Now he began to think in terms of really becoming involved in the soaring movement. A couple of years later Les began teaching thirteen-year-old daughter Jean to fly and found it a rewarding experience. Soon he found others wanting to learn and before long his weekends were devoted to instruction. By the middle 1950s it was evident that the population explosion in the Bay Area had doomed the poultry business and Les decided it was time for a change. So, after 30 years of helping to build up the chicken ranch, he began to tear it down and took on a new enterprise - subdividing the ranch. About four years, Les finally felt free to go ahead with his plans for making his dreams come true. The subdivision venture paid for a Nelson Hummingbird which Les bought for the purpose of publicizing and introducing more people to soaring. On weekends he used the Hummingbird to commute between Hayward Airport and Hummingbird Haven in Livermore. Many people became accustomed to the high-pitched noise of the little engine as Les gained height over the Hayward area. When Les had sufficient altitude, he would retract the engine for a nice long glide over the Livermore Valley. Before long Hummingbird Haven became too busy and Les had to look for a new base for his growing operation. Ultimately an opportunity arose for Les to become a partner in a 167-acre land venture in a location that was ideal for the gliderport that he had in mind. By this time, 1959, Les had accumulated his own small fleet of aircraft consisting of a 1-26 and a Super Cub in addition to Redwing and the Hummingbird. He was full of enthusiasm and determination to prove that a successful soaring operation could be developed. He and his partners agreed that he could develop 22 acres on the southern boundary of the property for his gliderport. Thus began nearly a year of physically exhausting work during which he laid out and developed his idea of an efficient gliderport. Almost single-handed he bulldozed and graded the runway and a road that ran into the airport and had them treated with oil and gravel. In conjunction with this, all the wearisome details of red tape had to be handled. It was necessary to have permits for everything from the use of the air space down to the hangar foundations. 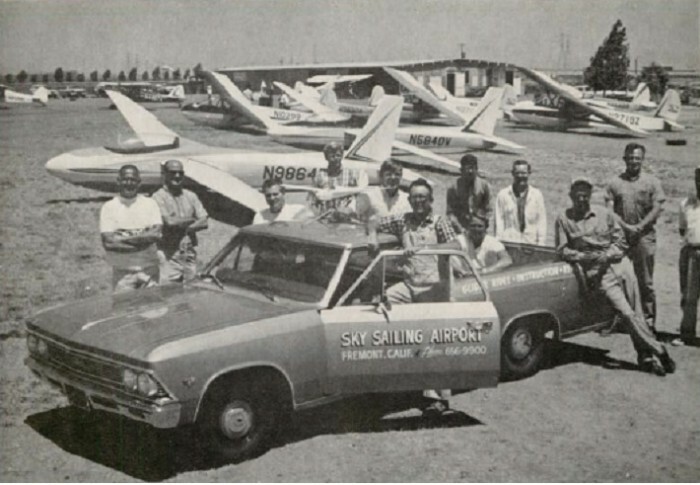 In June of 1960 the Les Arnold fleet moved to its new home - Sky Sailing Airport. By November of 1960 he had built a hangar housing 12 sailplanes, each in its allotted stall, and a few 1-26s hung from the rafters. The hangar was built so it could be dismantled if the land was sold. Other improvements were made with the same possibility in mind. Over the years, Sky Sailing and Les Arnold have provided several thousand people with their first introduction to soaring. The sight of sailplanes on tow, or circling in thermals, or polishing the ridge, became an everyday occurrence to motorists on the Nimitz Freeway in the Fremont area. In addition to his very successful soaring business, Les was an SSA Director and National soaring record holder. 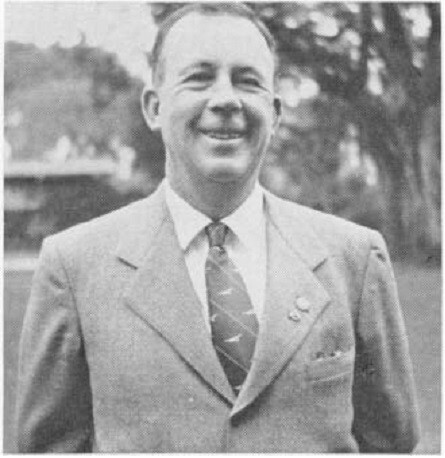 He was awarded the Eaton Trophy in 1968. Les earned both Silver #136 and Gold #32 in 1951. In 1977 PASCO established an award in Les Arnold's name in recognition of his many years of untiring devotion to the sport of soaring. One requirement for the award is that the recipient must exhibit the "Les Arnold Spirit". Much of the above was adapted from an article by Maybelle Arnold also known as Mrs. Les Arnold. Soaring, January 1967, page 11.